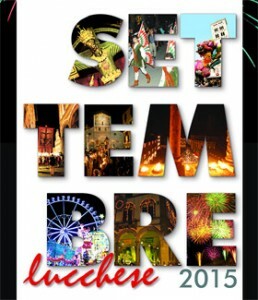 SETTEMBRE LUCCHESE – time to celebrate! September is the perfect time to visit Lucca as it is a month full of celebrations. There are religious ceremonies, markets, events and exhibitions plus the fairground, Luna Park, comes to town. The highlight is the Luminara of Santa Croce on the evening of 13 September. The town centre is lit by candlelight and from 8pm there is a medieval themed procession along the streets. The following day at 9:30pm there is a concert Puccinicano in the Piazza Anfiteatro. The “Murabilia Murainfiore Flower Show” is a gardening exhibition and market on 4, 5 and 6 September. Displaying a wide range of rare and unique plants and flowers, garden furniture and gardening equipment. In co-operation with the Botanical Gardens of Lucca, this annual garden show is an important showcase for gardeners and amateurs who take pleasure in plants, flowers and the garden in all its varied forms.